THE NUMBER OF air quality monitoring stations around Ireland is to double this year, according to Environment Minister Denis Naughten. 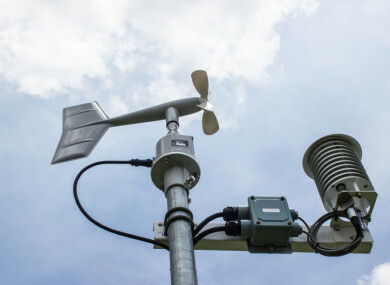 The Environmental Protection Agency (EPA) manages air quality monitoring stations around the country, which assess the air quality in each county. There are close to 60 monitoring stations at present, with some counties having more than one station. The minister said the new stations will be linked to the internet which will give the public access to real-time air quality information. “This will also help with our own pollen count projections that will benefit asthmatics at certain times of the year,” he said. Overall, the Air Quality Index for Health map scores Ireland quite well on air quality, but while Ireland has passed EU air quality targets, it hasn’t met WHO, EEA or the Protection of Human Health levels of what’s deemed safe. Naughten said the importance of air quality and the impacts it has on our health cannot be underestimated. He raised the issue before in 2016 when he spoke at a climate change conference stating that four people die from poor air quality every single day. In a week where trolley figures are dominating the headlines, Naughten points out that one in every eight hospital beds is occupied by a patient with respiratory disease, and the figure is much higher during the winter months. One in five children in Ireland have asthma, and it’s estimated that 440,000 people nationwide have chronic pulmonary disease. The minister said it is important to try to prevent people from getting sick in the first place. The more beds we provide in our hospitals, the more that will be filled. I am not suggesting that we curtail the number of beds but what I am saying is that we are not doing enough to prevent people from getting sick in the first place. It is the health of the most vulnerable groups in society that is jeopardised the most by poor air quality. In addition, a pilot initiative called the Warmth and Wellbeing Scheme is running in Dublin, with a view to rolling it out nationwide. It aims to measure the health and wellbeing impact of improving the energy efficiency in a home, with refurbishment. The scheme is open to children aged 12 and under and adults over 55 who are living with chronic respiratory conditions and in receipt of the Fuel Allowance or the One-Parent Family Payment. “Those who have availed of the scheme are reporting that they’re using less antibiotics, feeling warmer overall and the air in their homes is fresher. The anecdotal evidence is also showing that those who benefited from the scheme are attending A&E less and are also less likely to be admitted to hospital,” said the minister. Naughten said the roll out of more initiatives should hopefully have a knock-on impact on hospital admissions and overcrowding in the future. Email “More air quality monitoring stations on the way that will give real-time information to the public ”. Feedback on “More air quality monitoring stations on the way that will give real-time information to the public ”.